In Taiwan, the most typical housing type is a 5-story apartment with a central staircase. There are 2 units on every floor, each unit is designed for a single family. There is only dim light in both units and staircase. People rarely talk to neighbors. There are no trees inside. Everything is designed for surviving, not to enjoy life or to be inspiring by something happened in nature. APART-ment is a future collective housing treatment that breaks a typical housing APART in three scales: urban, unit, and personal. 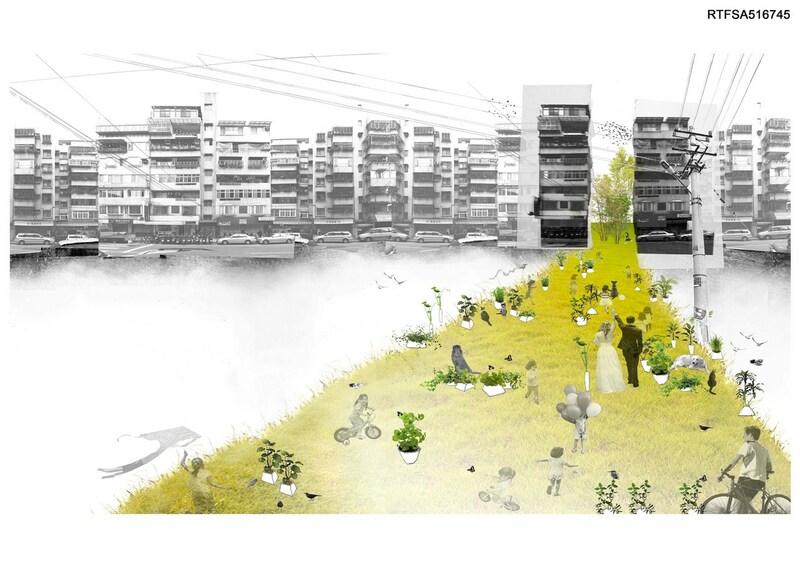 It aims to reconnect an intimate relationship between inhabitants and nature. 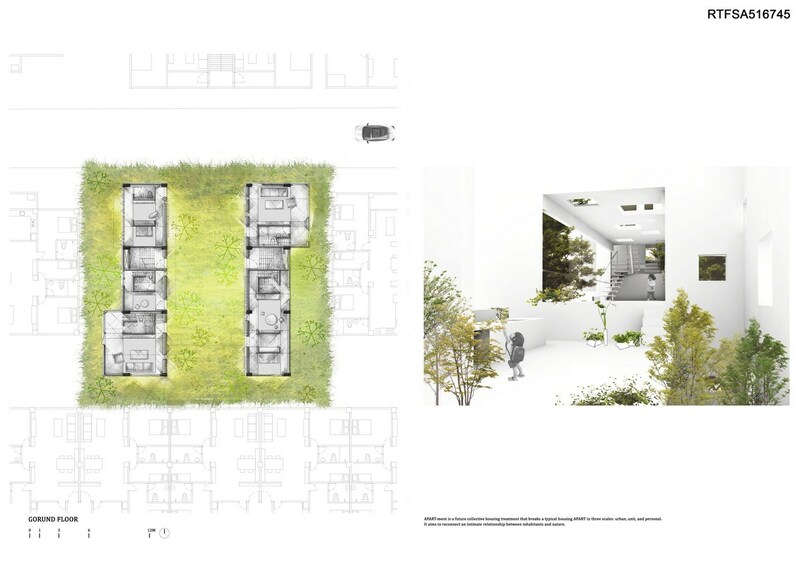 At urban scale, this design proposes to insert a “Green” playground into the housing block on the ground level. If other blocks also adapt this prototype, new small Urban Continues Landscape (or green paths) will gradually emerge in the city. As a result, “Green Paths” will become home for a new urban eco system. At unit scale, unlike the typical collective housing types, the APART-ment has 13 units in various types, 4 for single families, 3 for couples, and 6 for individuals. In the single families units, each has a “bridge room “ stretched above the “Green” playground in different heights. The “bridge room” strategy creates more communal experiences for its inhabitants. It also promotes desired interactions for the residents and the surroundings. At the personal scale, since living room, kitchen, bathroom, and bedrooms are not in the same flat level, walking through indoor and outdoor spaces, going upstairs or downstairs are the way to travel and experience spaces. “ Bridge room” brings flexibility of privacy and options of usages. For instance, it is a playroom for children but can also be a reading room for adult. 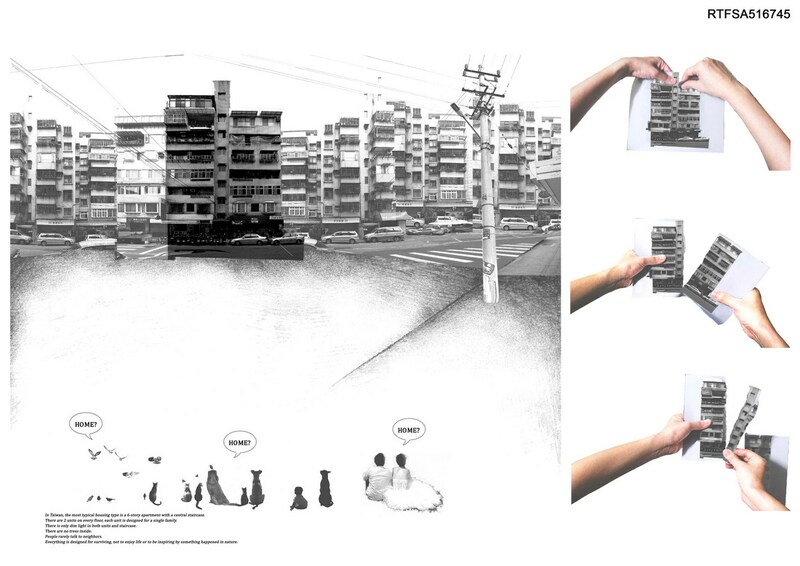 APART-ment is a proposal to challenge the definition of urban living in a high-density city. 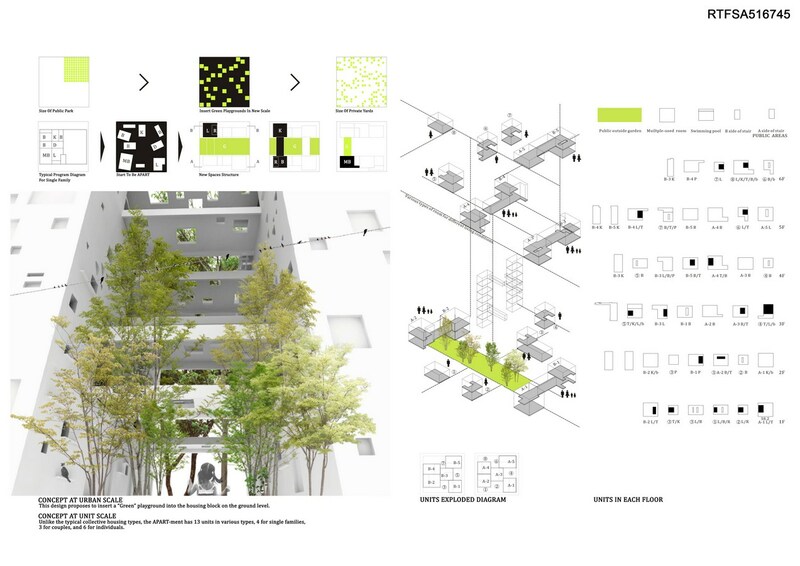 It reorganizes the conventional housing type to create new space that invite nature: light, rain, wind, trees, flowers, birds, cats, squirrels, butterflies, and beetles can all be part of our everyday living.